Extend Zero BS CRM using our API. Build something beautiful. 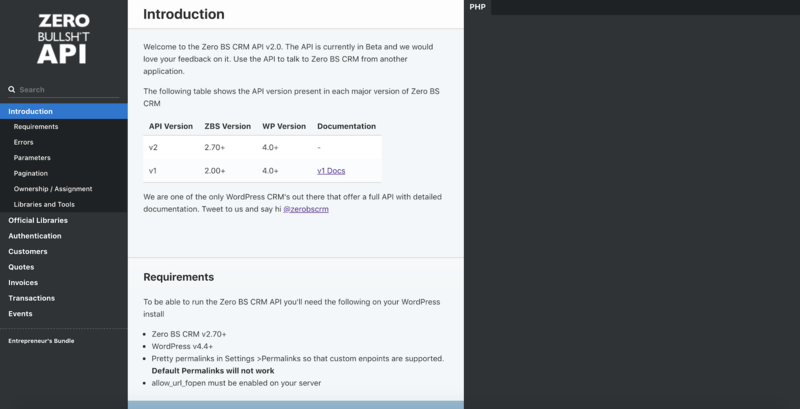 We are one of the only WordPress CRMs with API capability, and we are consistently expanding the developer-ready elements of ZBS to make it easy to build on top of the CRM. Develop your own integrations which can send data to the Zero BS CRM API. Using the API you can instantly update contacts, and much more. The choice is yours. Build what you like to connect to ZBS CRM. Our API is available to help you integrate additional functionality to the CRM. You may wish to integrate your own PoS system, or connect other websites or webhooks.